Sculptural artist McCrow’s current solo exhibition, entitled One Less Gun, has been extended by popular demand through August 6th, 2018 at HG Contemporary Gallery in Chelsea. McCrow, known for pioneering the concept of the art of disarmament, presents a collection of his newest sculptural pieces made from real firearms and munitions that were decommissioned with the help of his One Less Gun charity. 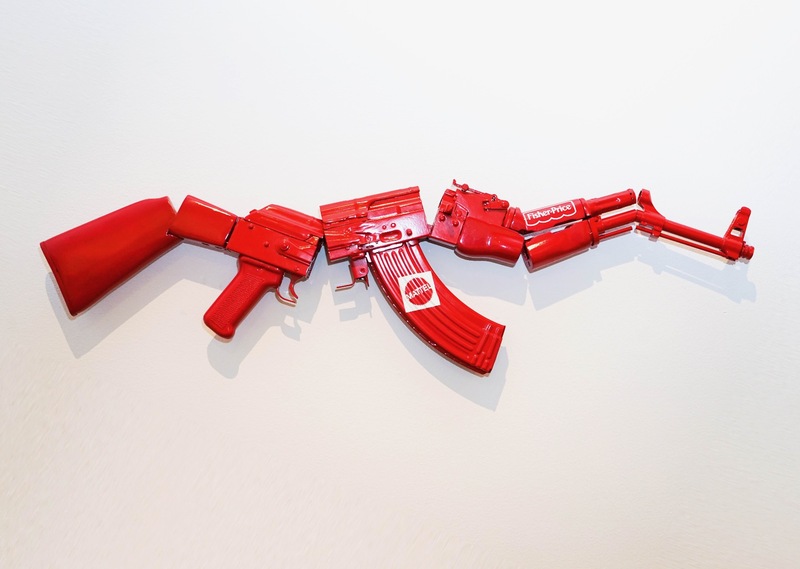 McCrow directs funds from the sale of his artworks to the building of specialist hardware for the destruction of weapons in areas suffering from the effects of war and gun violence; his ultimate goal, the destruction of 1,000,000 guns. When visiting the exhibition, the public can also support this mission with a simple $10 donation, which will in turn be used to destroy one illicit firearm. Donors will receive an inert round of ammunition with the serial number of the weapon destroyed as a unique form of symbolism. One bullet given; one more gun taken out of circulation. McCrow’s work emphasizes the global aspect of gun violence, showing that it is not a localized or regionalized problem, rather a worldwide epidemic killing over 1,000 people a day. The artist is also targeting institutions that have long fetishized and capitalized on gun violence – the movie and game industries. McCrow’s Gun Neutral campaign – backed by legendary director Martin Scorsese – calls on filmmakers and game creators to make a financial pledge to the #OneLessGun charity for every weapon on appearing on screen in their product. Gun Neutral is an ethical proposition, not a moral one. It is an opportunity for the industry to use their fictional weapons as a means to destroy small arms that could otherwise fall into the wrong hands. Such a commitment is a very public expression of consciousness and a tangible way for the industry to play a huge role in helping eradicate a major source of suffering.